Gregg Janos began his biology career in 2008 as a field technician before joining the Cincinnati Zoo as a summer camp instructor. His passion for field biology lead him to Copperhead in 2012 and he became full time in 2016. He received his B.S. in Wildlife Management from Eastern Kentucky University where his undergraduate research focused on winter habitat use and foraging behavior of Eastern Bluebirds. He then completed his M.S. in Biology at Bowling Green State University where he utilized acoustics to study bat habitat use and bats perception of owls. Over the years Mr. Janos has worked on and/or led mist-net surveys, radio-telemetry (including aerial), acoustic surveys, habitat assessments and cave surveys for the federally listed Indiana, gray, northern long-eared, Ozark big-eared, and Virginia big-eared bats. 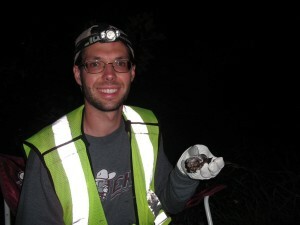 In addition to his experience with bats, Mr. Janos has experience radio tracking birds, macroinvertebrate surveys, snail surveys, and fish surveys. He is a KY certified pesticide applicator who has lead a team conducting timber stand improvement (TSI). He is also SCUBA certified and has experience working on fresh water mussel projects.